A kidney stone is a hard, crystalline mineral material formed within the kidney. Basically it started from contaminated water, and junk food, and excess of cold drinks. Kidney stones are a common cause of urine and often severe pain in the abdomen, flank, or groin. One in every 20 people develop kidney stones at some point in their life. Symptoms of a kidney stone include flank pain and blood in the urine. People those who take certain medications or supplements are at risk for kidney stones. Diet and hereditary factors are also related to stone formation. Kidney stones are typically made up of calcium and either phosphate or oxalate, minerals absorbed from food and normally excreted through urine. When urine becomes too concentrated, those minerals can crystallize to form stones. Aim to drink six to eight 8-ounce glasses of water a day to keep your urine diluted. Just 3 hours a week spent walking or 1 hour spent jogging handles dietary minerals in ways that lower your chances of developing a stone in your kidney. People who drink at least one sugar-sweetened soft drink every day have a 23% higher risk of developing kidney stones because they contain calcium, oxalate, and uric acid excretion, which contributes to stone formation and increase chances of kidney stone, avoiding these mineral could prevent from kidney diseases. Kidney Stone ko Urdu mein Gurde Ki Pathri bhi kehte hain. Gurde mein pathri hone ki koi ek khas wajah nahi hoti hai. Aaam taur par yahi dekhne main aya hai ke pani ki kami se iske hone ke chances zaydah ban jate hai. Khane mein is tarah ki cheeze shumal karna jo ki saaf suthri na ho, jese bazar ka khana. Chakundar, chocolate, palak jise english mein spinach kaha jata hai.Is article main bataya ge wazaaif parne se Insha ALLAH Kidney stone ka problem hal ho jaye ga. Khuain k gurde ki pathri ka ilaj quran me mojood ha aur iske parhne se Gurde ki Pathri chand hi roz mein thik ho jayegi, mariz ko shifa mileg in quranic Ayat ki barqat se. Take olive oil, lemon juice and pure honey mixed all these and take one spoon with one cup of water, early in the morning before taking break fast. After usage of just 3-4 weeks your kidney stone will be crushed and drained. Read given below Qur’anic Verse 11 times in the morning and 11 times in the evening and blow over the water and drink this water. Inshalla by the grace of Allah Almighty patient will get cured. Before and after this wazifa read dorood shareef 3 times. Read Surah Al-Bakara (Para-1) Ayat # 74 11 times and blow over the water and drink this water. 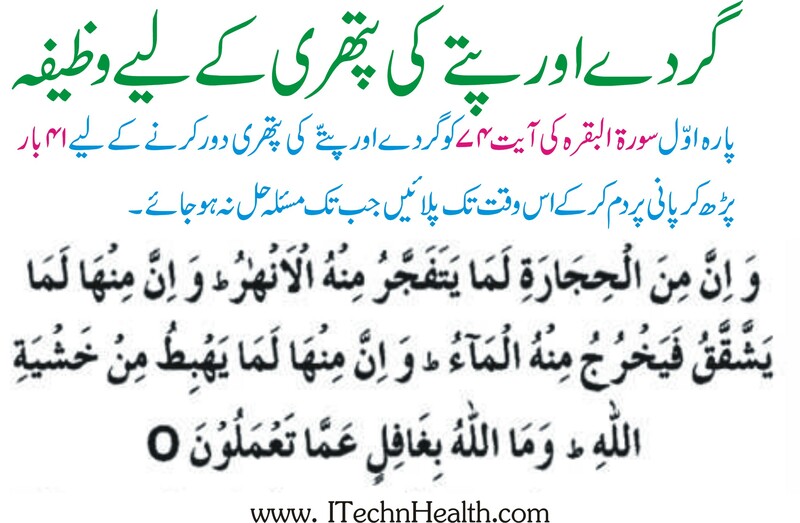 Ye wazifa parne se Insha ALLAH Gurde Aur Pite Ki Pathri ka problem hal ho jaye ga.